Over the weekend Adam and I went to the Wrigley Mansion for a tour and lunch for our February date (from our Year of Dates). Neither of us had ever been before, so it was a new experience for the both of us. We both loved the tour and really enjoyed out lunch at the mansion. Wrigley Mansion in Phoenix, Arizona was constructed in 1929-1931 by William Wrigley Jr. (yes, the chewing gum guy) as a 50th anniversary gift for his wife. It’s the smallest of the Wrigley’s six homes (Chicago, Philadelphia, Lake Geneva, Catalina Island, and Pasadena), so this was just considered their winter cottage. 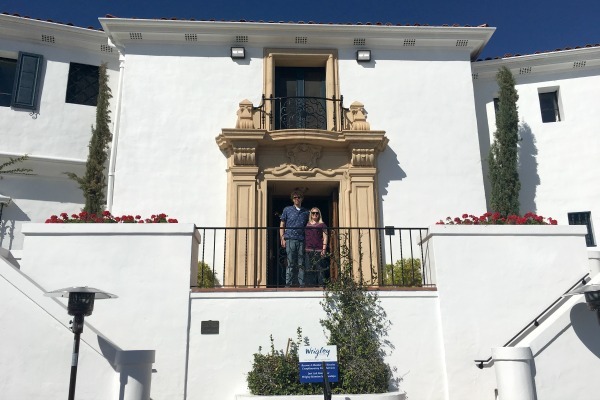 William Wrigley Jr. died in 1932, so he only was able to enjoy the mansion for a year. His family continued to visit until the mansion was sold in 1973. It changed hands several times of the years and at one point was almost torn down so new condos could be built. Luckily it was listed as a historic place and bought by Geordie Hormel (yes, the Spam guy) and his wife before that could happen. 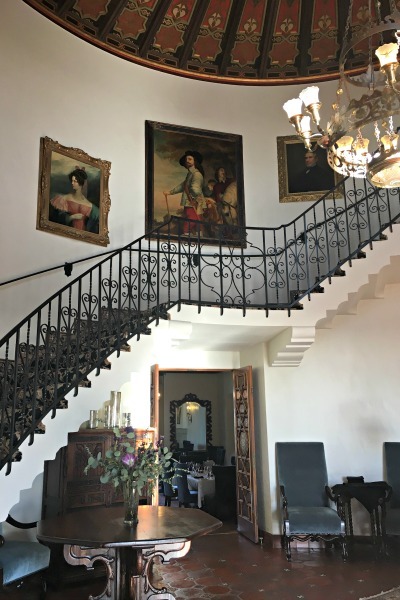 They restored the property and today it’s available for events, houses Geordie’s Steak restaurant, and a wine bar. 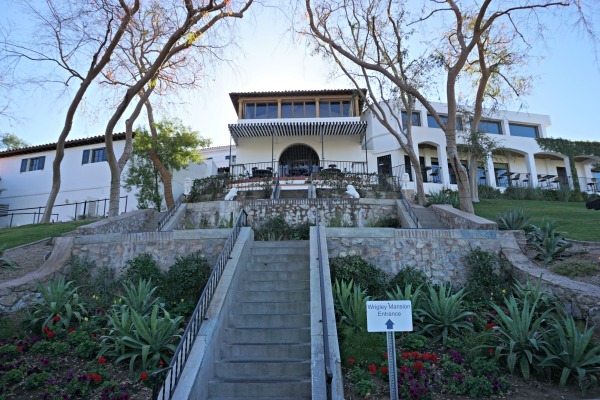 Wrigley Mansion is open for guided tours Tuesday-Sunday. Tuesday-Saturday tours can be combined with lunch as part of a package. We booked the Big Red lunch package which included the guided tour and 3 course lunch for $37/person. I honestly can’t recommend this enough. Our tour guide was excellent and shared so many interesting stories about the mansion, the Wrigley family, and the Hormel family. The views from the mansion are spectacular. 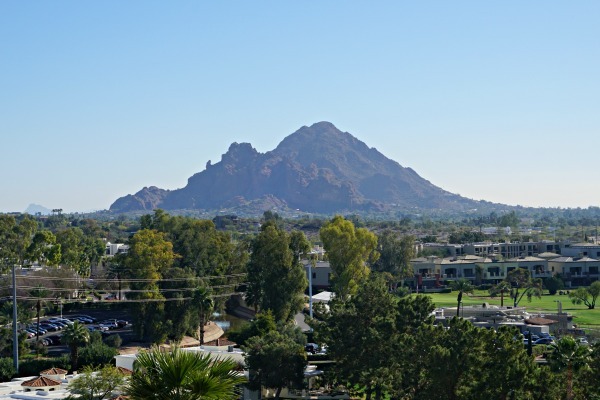 Below is Camelback Mountain, but you can see to Downtown Phoenix and a lot of the surrounding valley from the property. 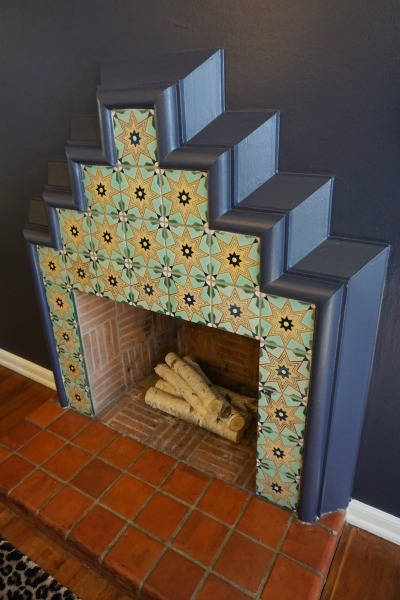 One of my favorite design features in the mansion is the Catalina tile that was used throughout the home. 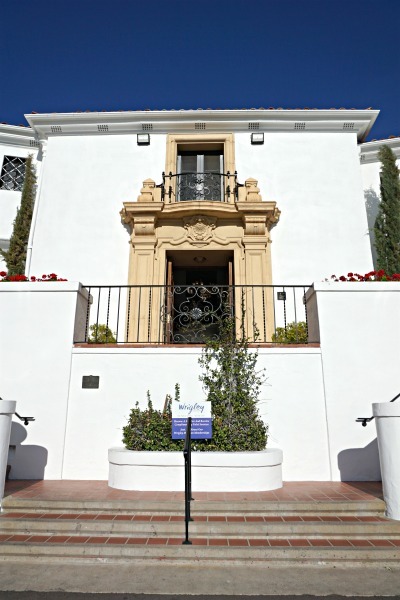 In addition to manufacturing chewing gum, William Wrigley Jr. also owned The Catalina Tile Company on Catalina Island. 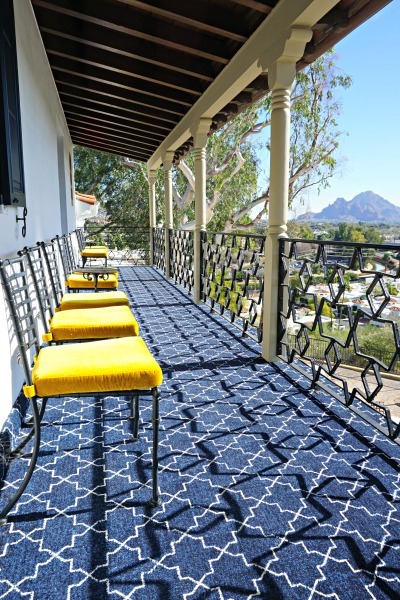 He had the tile shipped from the island to Arizona to use in designing his home. 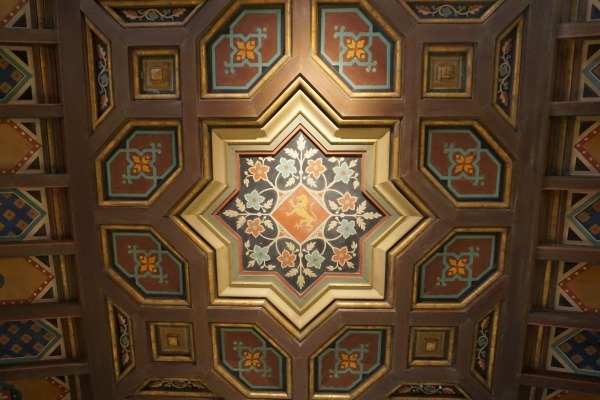 The original tile is still featured on the floors and fireplaces in the mansion. I think this proves that the decorative tile that’s trending right now can actually be classic and timeless. One of my favorite stories from the tour was how William thought women deserved to be pampered. Once a month all of his female employees were allowed to get their hair and nails done on company time…and he paid for it! He was also one of the first to institute the 5 day work week and provide benefits for his employees. The tour ended in a hallway of photographs. There are pictures of the mansion, the Wrigley family, and the Hormel family. I thought this old picture of the mansion was really interesting. 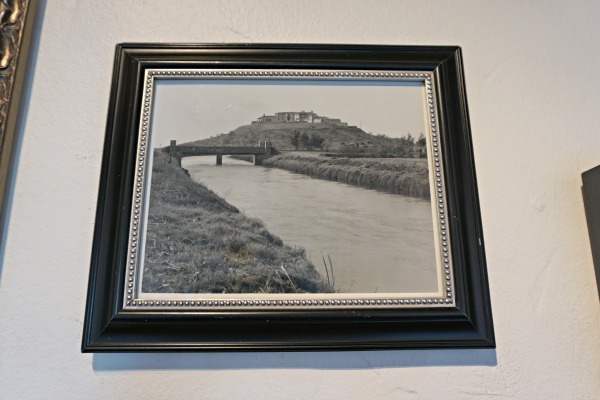 Now it’s surrounded by homes and offices, but when it was first built there was just desert and farmland. After the tour we were free to explore on our own and could head down for lunch whenever we were ready. We had lunch in the part of the restaurant that was the mansion’s original dining room. We both started with salads and for the main Adam had a grilled chicken sandwich and I got the chicken pesto pasta. For dessert Adam picked the chocolate mousse cake and I picked the apple tart. Everything was delicious and the service was excellent. With tip, the tour and lunch was a little over $100. I thought that was really reasonable for everything, but if you’re on more of a budget they also have the Juicy Fruit lunch tour which includes the tour and 1 course for $26/person or just the tour for $15/person. 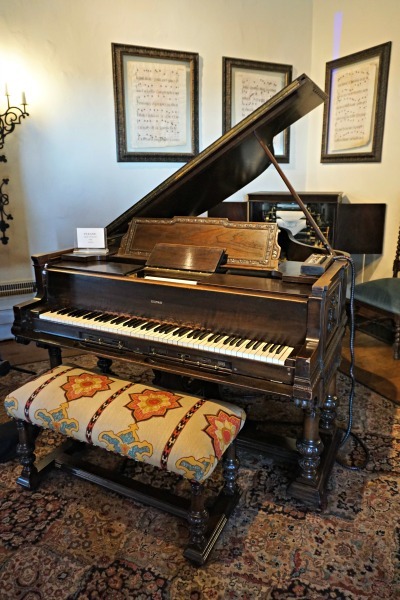 If you live in the Phoenix area and have never been to the Wrigley Mansion, I highly recommend a visit. Or if you are visiting Arizona, it’s definitely worth a stop. The tour is mostly indoors, so it would be a good place to visit in the summer too. Wow this place looks wonderful! I lived in Southern Arizona for a few years, I would have loved to known about this place. Thank you for sharing! I'll put this on my list of MUST DO's next time I'm in the area. Hopefully you'll get a chance to stop by if you're ever in the area again! Oh wow what a gorgeous setting for a date and a wonderful place to explore. The interior and design is amazing, very opulent but also homely. That's a great way to describe it! It is opulent while still feeling like a home and not completely over the top. Cool that you can have lunch there too. I definitely think they picked the right spot - great view. And great tiles on the fireplace for sure. The view is amazing! I bet sunrise/sunset is gorgeous from there! Knocking it down for condos would have been such a shame! I'm glad they were able to preserve it. This place looks so pretty. I had no idea Wrigley owned a tile company, that's a fun fact. And I love the design of the tiles! I didn't know about the tile company either! Definitely a fun fact! There are so many secret cool spots in Arizona! It's so awesome that you and Adam take the time to find and explore them. This mansion is so beautiful and unique! There are so many cool places around AZ! It's been so fun to play tourist! We love doing home tours! This is the first I have seen that provides lunch! Definitely saving this for when we make it to Phoenix! They also have a wine bar! Man, what a guy! A mansion for his wife's anniversary and hair and nails for his employees! They don't make them like that anymore. Also, those balcony views. Serious wanderlust! I know, right! I wish my employee paid for my hair and nails! Fascinating! I love the history behind old homes! Me too! The guide shared so many interesting stories!